Happy Monday everyone and welcome to another Technostamper Monday Lunchtime Sketch Challenge! Mary Jo has a fun sketch for us this week and I just couldn’t resist using some of my NEW stuff! I will admit that when I first saw this set and matching framelit I wasn’t so sure about it but it really is a FUN set! 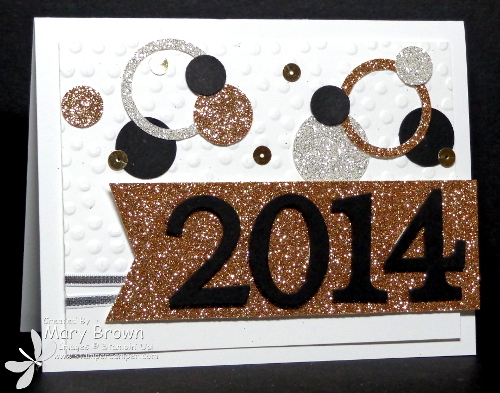 I decided I really wanted to make it bright and colorful and embossing is perfect for that! Stamp the Oh Happy Day stamp on Basic Black using Versamark ink and emboss using Melon Mambo embossing powder. Cut out with matching framelit then add using dimensionals. Stamp Celebrate image using Versamark on Bermuda Bay and emboss using Basic Black embossing powder. Cut out with matching framelit and add using dimensionals. Stamp the greeting using Versamark on Melon Mambo and Black Emboss. Cut into a banner and add to the card front using dimensionals. Add some Basic Rhinestones to finish it off. I thought this was such a great sketch and the Starburst Sayings were just perfect for it! Don’t forget to check out the other members of the team and remember go to the Technostamper blog to play along! And here we are on the last day of the Create with Connie and Mary Valentine Special Collection and as promised here is my 4th card using the Sweet Sayings Notecards from the Whole Lot of Love Collection (just like we featured in the Create with Connie and Mary Valentine Special Collection). Here’s my first Sweet Sayings card, my second Sweet Saying card and my third Sweet Sayings card in case you missed them. I’m really enjoying the the Starburst Sayings set and matching framelits so I decided to use that on my last card. Punch out 5 chevron pieces from Coastal Cabana and add to notecard. Add 1/4 strip of Crisp Cantaloupe to the notecard. 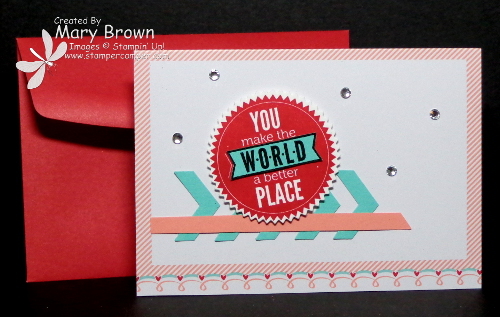 Stamp greeting using Real Red and cut out with matching Starburst framelit. Stamp the ‘world’ section using versamark and black emboss. Cut out and add to starburst. Add some medium basic rhinestones to finish it off. We are soooo excited to be offering a Valentine Special Collection featuring the stamps and products from the Whole Lot of Love Collection and we are currently on Day 4 (our last day) of our special 4 day collection! AND…FOR THE FIRST TIME…Connie and I will be offering for additional cost kits containing everything you need (except stamped images, adhesive and chocolate) to make the projects! We are sooo excited. Projects will be released to our subscribers one each day December 26, 27, 28, and 29! Well it’s Day 3 of the Create with Connie and Mary Valentine Special Collection and as I promised yesterday I’m sharing four days of ideas using the Sweet Sayings Notecards. 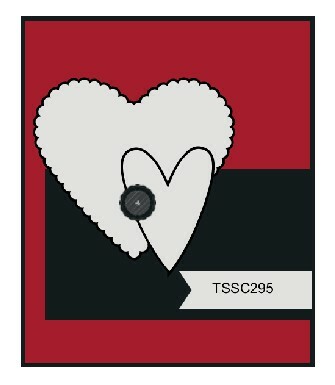 This is a fun little card using the same set that I used for my card set for the Valentine Special Collection. Here’s my first Sweet Sayings card and here’s my second Sweet Saying card in case you missed them. 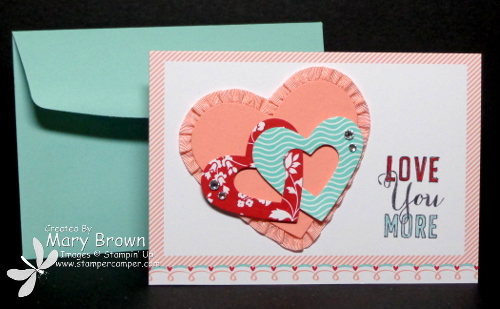 Cut out 3rd to smallest heart framelit using Crisp Cantaloupe. 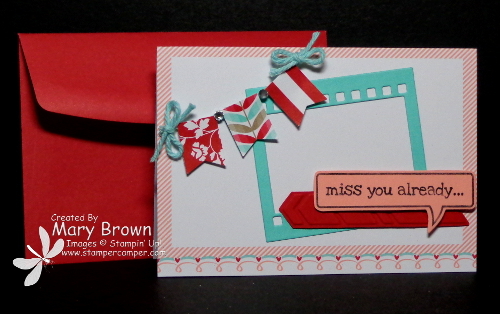 Add Crisp Cantaloupe ribbon around back then add to notecard using dimensional. Add Basic Rhinestones to the interlocking hearts to finish it off. We are soooo excited to be offering a Valentine Special Collection featuring the stamps and products from the Whole Lot of Love Collection and we are currently on Day 3 of our special 4 day collection! So head over to the Create with Connie and Mary site to learn more about our Mini Collection and SIGN UP TODAY!!!! Since today is the second day of the Create with Connie and Mary Valentine Special Collection I thought I have another share something using one of the products from the Whole Lot of Love promotion (just like we are using products from this for our Valentine Special Collection). I bought these notecards when I bought my stuff for my Create with Connie and Mary projects but then I wasn’t quite sure what to do with them. I decided to challenge myself to make four cards to share with all of you. In case you missed it…here is my Sweet Sayings notecard from yesterday. So make sure you check back tomorrow (Saturday) and Sunday to see my other 2 cards! Stamp banners from SAB Banner Blast using Real Red, Pool Party and Crisp Cantaloupe. Punch out using Banner punch. Cut a piece of Pool Party Twine (Sweet Sorbet Accessories – SAB). Add banners to the twine using glue dots. Make two small bows from the Pool Party Twine, add to banner. Add small Basic Rhinestones to the Crisp Cantaloupe banners and to the ‘o’ in the love banner to finish it off. We are soooo excited to be offering a Valentine Special Collection featuring the stamps and products from the Whole Lot of Love Collection and we are currently on Day 2 of our special 4 day collection! Happy day after Christmas! Did you all have a nice day? We did…quiet…but nice! I like quiet! But the holiday is over and time to move on. TODAY is not ONLY the Create with Connie and Mary Thursday Challenge BUT also the start of the Create with Connie and Mary Valentine Special Collection where we are featuring products from the Whole Lot of Love collection and I decided that today (and for the next THREE days) I’m going to feature these cute little notecards! Haven’t seen a “whole lot of” stuff done with these and decided to play! (So make sure you come back the next three days to see my other Sweet Sayings creations! Now’s the time to join!!!!! 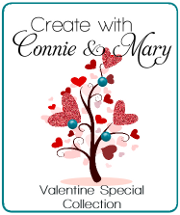 Create with Connie and Mary has launched our Valentine Special MINI Collection today…December 26th! That is so we give our demo subscribers plenty of time to set up their classes! Sign up TODAY at Create with Connie and Mary so you don’t miss out! 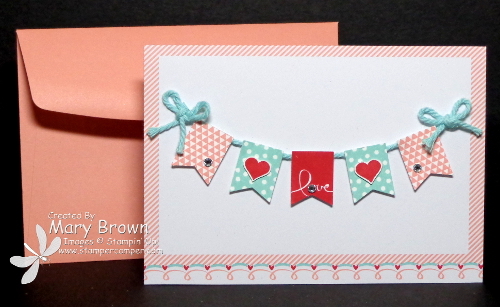 A mini session featuring the Whole Lot of Love Valentine suite of stamps and accessories! NEW! Kits of supplies for each project will be available to purchase! Featuring the Fresh Prints Designer Series Paper Stack on all our projects! Here’s the details on my card.. Bunch banners using the Banner Punch (SAB) from the Fresh Prints dsp Paper Pack. Cut out piece of Real Red cardstock 3 1/4 x 1/2, run through Arrows embossing folder and trim to look like arrow. Add to notecard front. Stamp greeting using Basic Black on Crisp Cantaloupe, cut out with matching framelit and add to notecard front using dimensionals. Add small Basic Rhinestones between the banners to finish it off. MERRY CHRISTMAS everyone! I hope that you are enjoying your day! This is the Christmas card that I sent out this year. Hopefully by now everyone has received theirs so I can show it here. With school not finishing up until mid-December (I sure do miss having off from Thanksgiving through New Years!) I’m having a tough time getting things done…EEK! So this year it needed to be nice and easy which is what this is. Whisper White – 4 1/4 x 11 folded. Whisper White – 4 1/4 x 3, run though the Decorative Dots (SAB) Embossing folder (LOVE how it looks like snow!). Silver Glimmer – 1 x 3 cut into a ‘curvy’ line and added to the panel. Add panel to card front using dimensionals. 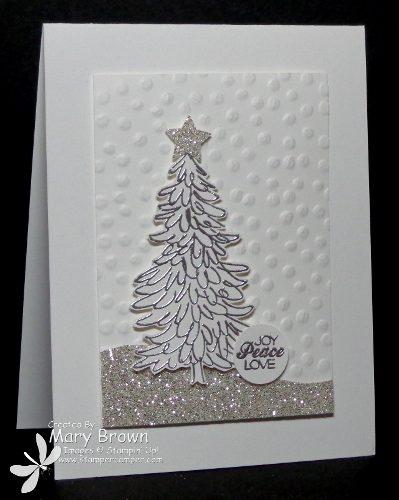 Stamp tree in Versamark, silver emboss, cut out and add to card front using dimensionals. Punch Star (Merry Mini punch pack) from Silver Glimmer, add to top of tree. Create with Connie and Mary is getting ready to launch our Valentine Special MINI Collection immediately after Christmas on December 26th! That is so we give our demo subscribers plenty of time to set up their classes! Sign up TODAY at Create with Connie and Mary so you don’t miss out!